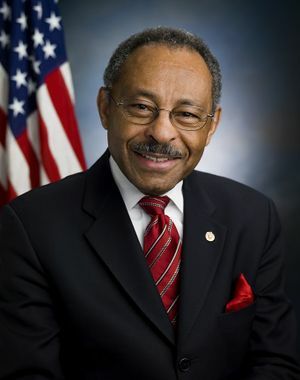 Roland W. Burris was a Democratic member of the United States Senate, representing Illinois. Burris served as the National Bank Examiner for the Comptroller of the Currency, U.S. Department of Treasury (1963-1964) and Vice President of the Continental Illinois National Bank (1964-1973). Burris was then a member of the Governor’s Cabinet, where he became the administrative officer in charge of Central Management Services for the State of Illinois (1973-1977). In 1978, Mr. Burris was elected Comptroller of Illinois and he served three terms, until 1991, before being elected Attorney General (1991-1995). From 1991 to 1994, he also served as a Trustee to the Financial Accounting Foundation Board. Before his Senate career, Burris was Chairman/CEO of Burris & Lebed Consulting, LLC. Burris served three years as a Trustee on the Executive Board of the Government Finance Office Association of the United States and Canada. He served as President of the National Association of Comptrollers and President of the National Association of State Auditors, Comptrollers, and Treasurers. He also led the successful effort to create a Comptroller for the U.S. Government. Burris earned his Bachelor of Arts in political science from Southern Illinois University. He earned his Masters Degree in International Law as an exchange student in Hamburg, Germany, and earned his Juris Doctor (JD) from Howard University Law School. He is married to Berlean M. Burris, PhD, and is the father of two adult children, Roland Burris II, JD, and Rolanda Burris, PhD. In i983, Roland Burris served on the Harold Washington Campaign Steering Committee. In 1983, Roland Burris, Comptroller, State of Illinois served on the incoming Chicago Mayor Harold Washington's transition oversight Committee. Burris was a member of the Congressional Progressive Caucus, during his brief time in the US Senate. This page was last modified on 18 September 2015, at 23:24.